At the time, the Sooners (along with Notre Dame and Nebraska) were seen as the wholesome alternative to the "antics" at the University of Miami. But it turns out OU was doing its own young and thuggin' thing out in Norman. 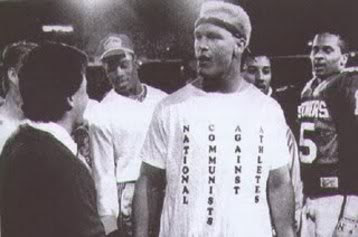 Coached by the swashbuckling Barry Switzer, Oklahoma left a path of destruction in its wake, culminating with Brian Bosworth's infamous "National Communists Against Athletes" t-shirt mocking the NCAA at the '87 Orange Bowl. (Why was he wearing a t-shirt? 'Cause he'd been suspended for steroid use.) When the Boz's book came out a few years later detailing rampant drug use and other assorted debauchery, the Sooners badass legend was cemented. Oh, and they were good too, going 33-3 in '85-'87 and winning the chip in '85.